To address this requirement, I found one solution which is through SAP Extensions. We can enable “SAP Extensions” for a user group so that users of that group when log on to WebI, they would see an “SAP Extensions” tab which will allow us to set the refresh frequency. 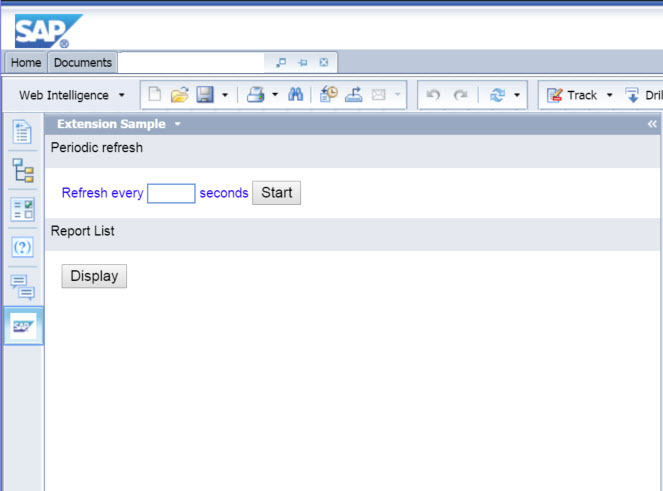 Now when you ( if you belong to the user group for which the extensions are enabled then) log on to BI Launchpad, you would see a new side panel called “SAP Extensions”, there you can provide your refresh frequency. You can set any frequency ( in seconds) that you want and report would pull latest data from database and show it on the screen. You can set frequency in minutes, and not in seconds. Thanks for sharing the BI 4.2 SP6 new feature. I’m looking forward to start using SP06. This solution by Rogerio Plank has been out there for a while now. The solution suggested in above in this post is making use of “SAP Extensions” which doesn’t require any coding, it’s just needs to be setup right.